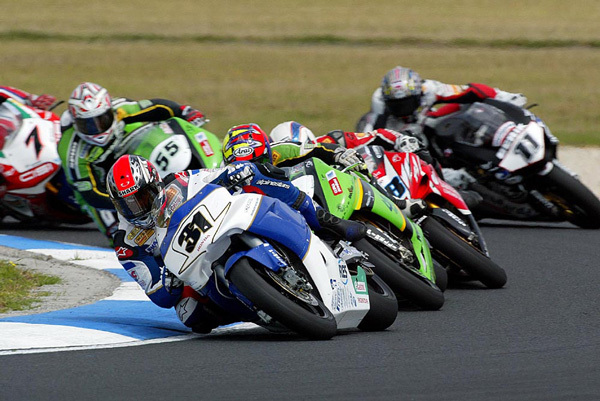 A keenly contested opening qualifying session at Phillip Island, held in high temperatures throughout, finally delivered third place to James Toseland (Winston Ten Kate Honda) as the Englishman fought it out with local riders Troy Bayliss and Troy Corser, plus former MotoGP rider, Alex Barros. The top four were all within less than half a second of each other, with the next rider, Kagayama, over one second from provisional pole. Karl Muggeridge (Winston Ten Kate Honda) was not running at his full pace, seeming to be over-anxious to get into contention right away, and losing ground in both set-up and individual lap times. His top 13 placing, from 28 runners, is expected to be improved upon in the final qualifying hour, to be held on Saturday morning. Hot track temperatures of over 50 degrees did not help any of the top riders in their search for outright grip, and made for a physically gruelling session. "The bike is very fast around here in top speed too. We had to take some pieces from our fairing, because it seems to out of spec with the rulebook, and now we are even faster in top speed. So that was a nice thing to be directed to do by the technical director. Karl is playing catch up at the moment, but he will get there. Maybe he is trying too hard, in front of his home crowd. I am expecting him to get the front of the second row and the bike in general is working very well, even though there are some more things to try tomorrow." We just started off today on the wrong leg, just racing, racing around to try and get everything sorted out. I'm putting too much pressure on myself to try and get it right, rather than being calm. So I made too many mistakes and not getting things right. It's a little bit foreign at the moment to I just need to get it settled down. It'll work out for sure." Karl Muggeridge (Winston Ten Kate Honda) will start from a second row grid position, having qualified sixth fastest with a time of 1'33.571, also beating his regulation qualifying time. Muggeridge is the fourth Australian rider in the top six places, proving how much of a boon local knowledge and support means at this fast and sun-drenched track. "After we saw how things went for Karl yesterday, it was pretty good for him to get onto the second row today. I think he had some things on his mind, like his little boy back in Switzerland. Now he is fully focussed back here. 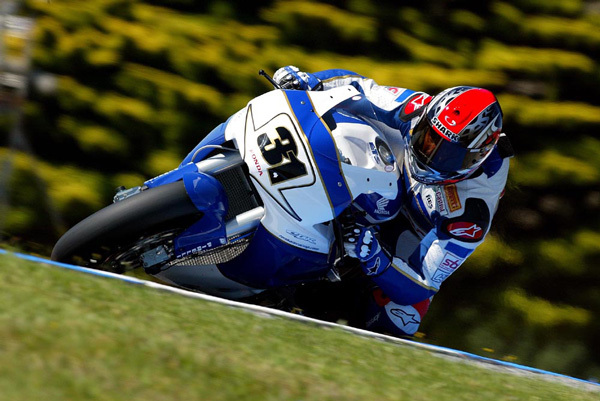 We are sure he can do well here tomorrow, because on a race set-up he is running quite a constant pace. Tomorrow morning we will make use of warm-up to define race set-up. With James we are really close, for Karl we maybe have to do a bit more to play catch up, because we almost lost yesterday. I'm happy, we are looking good, and I don't think anyone can make five or six laps into the 1'32s. I would be very surprised with that." "Not so bad, considering that yesterday was such a disaster. We had to chase like hell today to make everything in a better direction. I wasn't extremely happy with my Superpole lap but we made some big changes between yesterday and today, but it has worked. We still have stuff to do in warm-up on Sunday but I feel much better on the bike today." For Karl Muggeridge (Winston Ten Kate Honda CBR1000RR) it was a less happy day, being forced to pull out of race one due to concerns over tyre wear and machine handling, then being taken out by another riders' crashing machine in the second outing. Muggeridge now finds himself 15th in the title chase, with an unchanged 11 points. 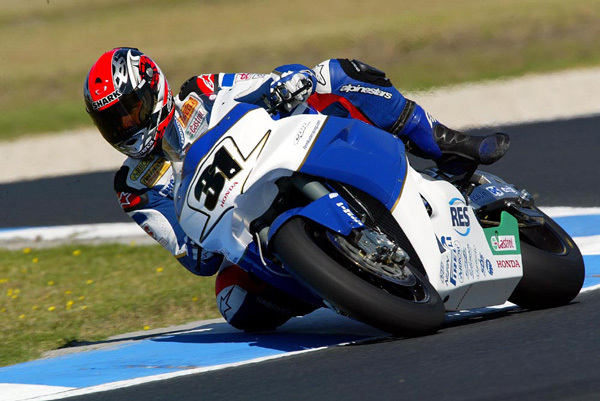 In the first race Toseland secured a fine third place finish, after early leader Troy Bayliss had used up his tyres in he desperate escape from a chasing pack, sliding down the order to finish sixth. 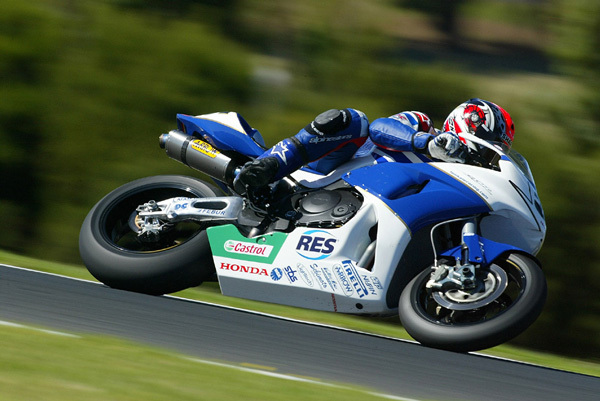 Toseland held his nerve throughout, finishing seven seconds from the winner Troy Corser (Suzuki) and close second place man Alex Barros (Honda). 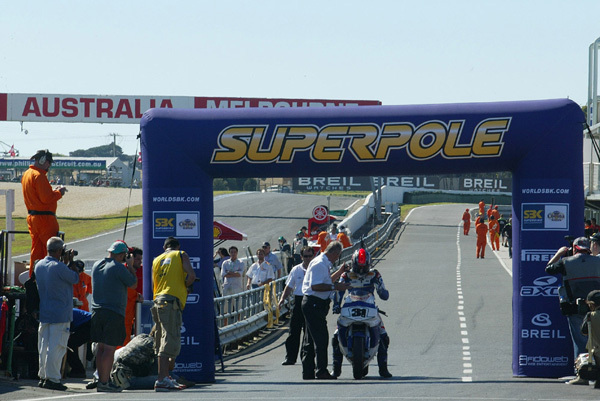 In the second race Toseland stuck to the lead for the majority of the race but eventual race winner Troy Bayliss passed him on the 16th lap, leaving Toseland a clear second place finisher, five seconds adrift, but nine seconds up on Barros. "For Karl I feel really sorry, because the problem James had in the first leg was even worse with Karl, so we also had to make adjustments to Karl's bike. It was running a lot, lot better in race two, until he got T-Boned. It was a difficult weekend for him because the first day was such a nightmare we had to play catch-up. We just ran out of time but I am quite sure that he has got the potential in him to get the best out of the bike." 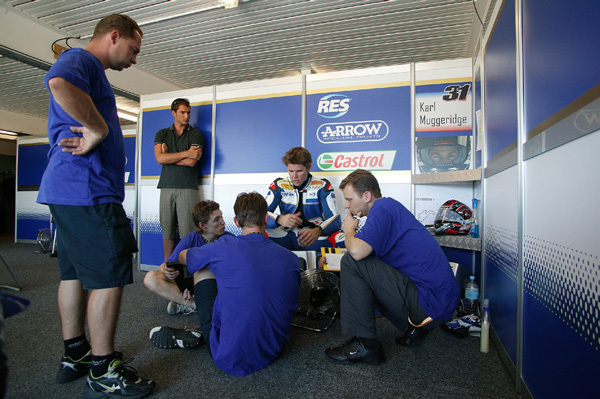 "A terrible weekend in the office, but at least in the second race we had the bike a lot better. We made a bit of a mess on Friday so we had to catch up all weekend. Even though it was a crash from someone else that took me out of race two, I can walk away confident. The bike is a lot better now so we can do it for sure."